Immunogen: Synthetic peptide corresponding to the sequence near the C-terminus of dehydrin. The sequence is completely conserved in barley, rice, maize and wheat. Scientific Background: Dehydrins are a family of proteins that become abundant during dessication in seedlings and embryos of cereal crop plants including barley, corn, wheat, and rice. Dehydrin proteins have a highly conserved lysine-rich block (KIKEKLPG) found near the carboxy terminus which appears to be characteristic of, and unique to Dehydrins. 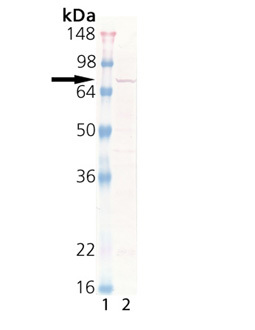 Western blot analysis of Dehydrin (plant), pAb: Lane 1: MW marker, Lane 2: Corn.